With our bouncing baby lambs, newly hatched chicks, and naturally colored eggs, we were all ready for Easter. With our happy hens now laying over 50 eggs a week, we're eating a lot of eggs. A hard boiled egg is one of my favorite quick snacks, and having a cheerful red vintage Pyrex bowl of them sitting in the fridge is always a comforting sight. 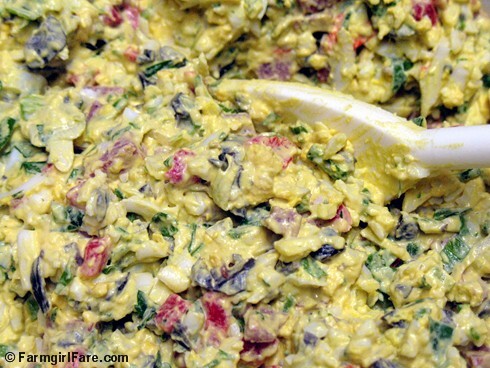 Having a bowl of this brightly colored egg salad sitting in the fridge always feels like a treat. This is the perfect thing to have on hand during busy times like lambing season, when mealtimes can be erratic, and you never know how long a trip to the barn is going to take. A few bites of this filling and protein-packed egg salad atop a couple of crackers, and I'm ready to tackle anything. The recipe comes from The Artist's Palate: Cooking with the World's Great Artists, one of my favorite books, which I rave about in Feeding My Addictions and A Simple Pasta Recipe: Linguine with Olive Oil, Garlic, Pecorino Romano, and Parsley. If you love food and art, you're going to love this beautiful book. This batch was made with duck eggs—they really are that yellow! The recipe notes say that it's a nice dish for a picnic or a children's party. What intrigued me is that the eggs are grated rather than chopped or sliced. This takes a little more time than using an egg slicer, but it gives the salad a completely different—and very nice—texture. I added the scallions and parsley for even more confetti color and flavor. The original version simply calls for 'salami.' I usually use our homegrown lamb salami, which comes in a small chub and is what I call summer sausage because I grew up near San Francisco and the only type of salami I knew was hard Italian dry. I think any type of salami or summer sausage would do. A digital kitchen scale is great for weighing ingredients like the salami (and postage!) and well worth the investment. I often use mine several times a day. In a large bowl, combine the eggs, olives, pimentos, 4 ounces of the salami, scallions, and parsley. Stir in 3/4 cup of the mayonnaise. Add salt and pepper to taste. Mix in the remaining 1/4 cup of mayonnaise and/or another 4 ounces of salami if desired. Spread on crackers, use as a sandwich filling (perhaps on some freshly baked, easy to make Farmhouse White Bread? ), or simply eat it straight out of a little dish with a spoon. It tastes even better if made ahead of time and allowed to chill for a couple of hours before serving. © FarmgirlFare.com, the mellow yellow foodie farm blog where these days farm fresh eggs are what's for breakfast, lunch, dinner, and occasional snacks—and of course they also find their way into lots of scrumptious baked goods, too. As this photo appeared on my screen, at first I thought it was beautiful flowers in a garden! Then I realized it was some scrumptious looking food! Your photos are always beautiful! Thanks for sharing! i am going to try your version but a smaller batch because the other half is not so adventurous as myself,yep looks very tasty. Seems like your type of blog, m'friend. Beautiful! I wonder how it would taste with chard stems added? I'm knee deep in Bright Lights swiss chard and am looking for ways to use it up. The red, pink, and yellow stems would fit with theme of this dish. What a beautiful mix & match egg colourful salad!! What's not to love??? Questions? Do you ever have trouble peeling fresh hard boiled eggs? I always do. I get my eggs from a co-worker who has his own chickens and whenever I hard boil them they are so hard to peel. Now I leave them in the back of the fridge when I know I want to hard boil them so they get a little older and easier to peel. Where is my fork? Yummmmm! Looks like all the fixin's for a Cobb salad!! A few hens and a few ducks in the middle of a city have me eating A LOT of eggs, too. I started making my own mayonnaise. I can't believe how simple it is with the immersion blender, and the taste is SO much better than store bought. I'd be SUPER interested in the variations you come up with. That looks like a delicious salad!